While I was looking through one of my old cases for my Space Marine Battlefleet Gothic fleet (which will appear on here soon) I cam across some old models. These were guys that I had just painted for fun and had never been a part of any army. I kept them mostly because I was fond of the paint jobs, also I didn't know what else to do with them. Well I figured since they have just been sitting in a figure case for years on end I might as well sell them, so I broke out the brushes, touched them up a bit to improve some glaring mistakes (mixing white in with boltgun for highlights, what was I thinking?) and threw them on Ebay. Long story short I figured I would show them on here as well. I can't remember which on is older, but they were both completed back when I was 16 and worked at a GW store. First up, Lysander. 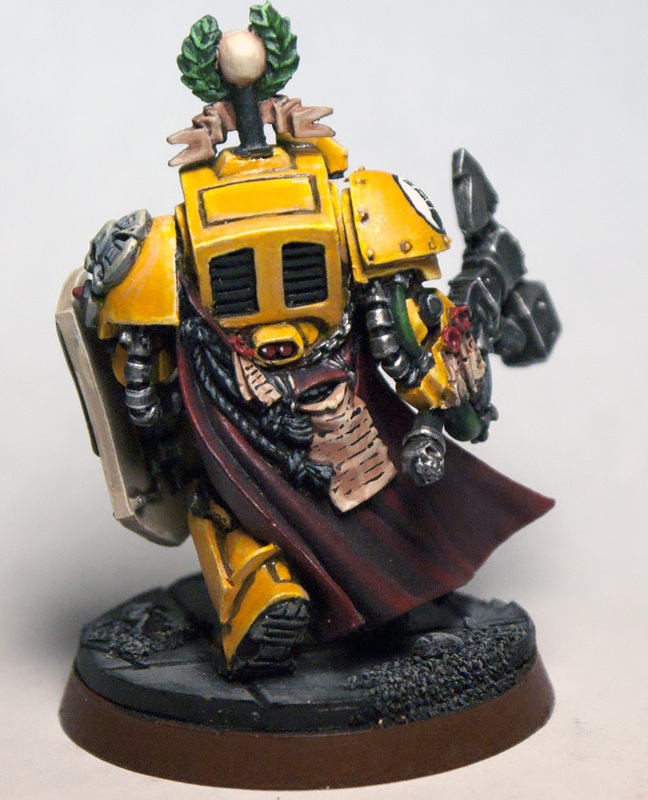 I painted this guy back when the model was first released. 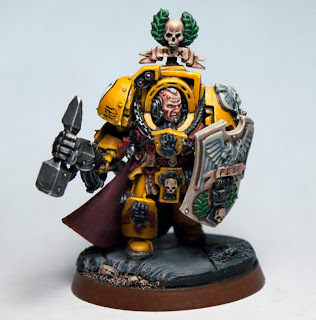 Originally my plan was to do the Imperial Fists 1st Company using Deathwing rules, I even bought several squads of Terminators to do it. 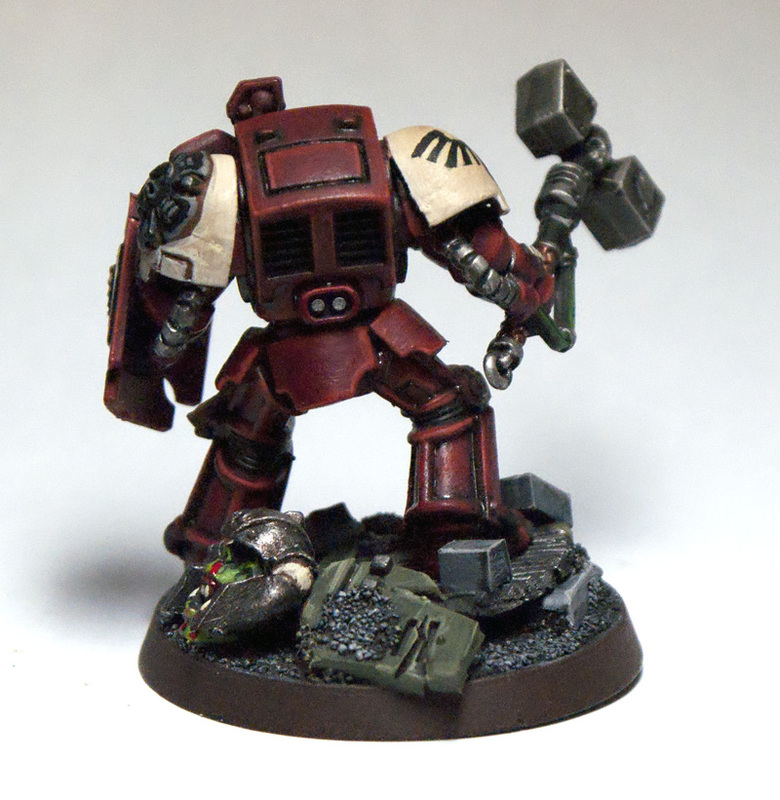 Sadly that never happened, although the Terminators did find homes in my next few marine armies as well as several conversions. 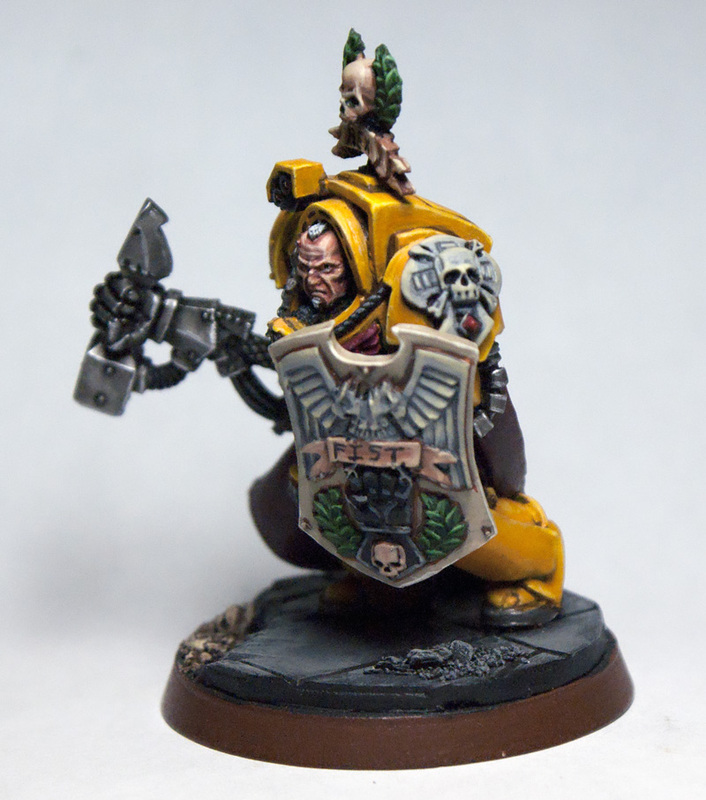 He was painted back before washes and foundation paints existed (the dark ages) so yellow was an even larger challenge. Luckily I found a easy and effective recipe for it online. That is in fact not yellow paint, but Bronzed Flesh shaded with Bestial Brown and highlighted up with Bleached Bone and Skull White. After I painted all the armor in this fashion I gave the whole thing a wash of Yellow Ink and viola! It saved a ton of time and looked great too. I'm even inclined to think it looks better then a lot of modern yellow recipes that make use of Iyanden Darksun. 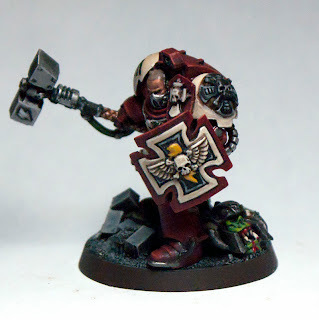 Next up is THQ and GW's love child, a Blood Raven. Leading up to the release of the plastic Assault Terminators back when the Black Templar codex was coming out each staff member at our store was given enough parts to make on Termie. 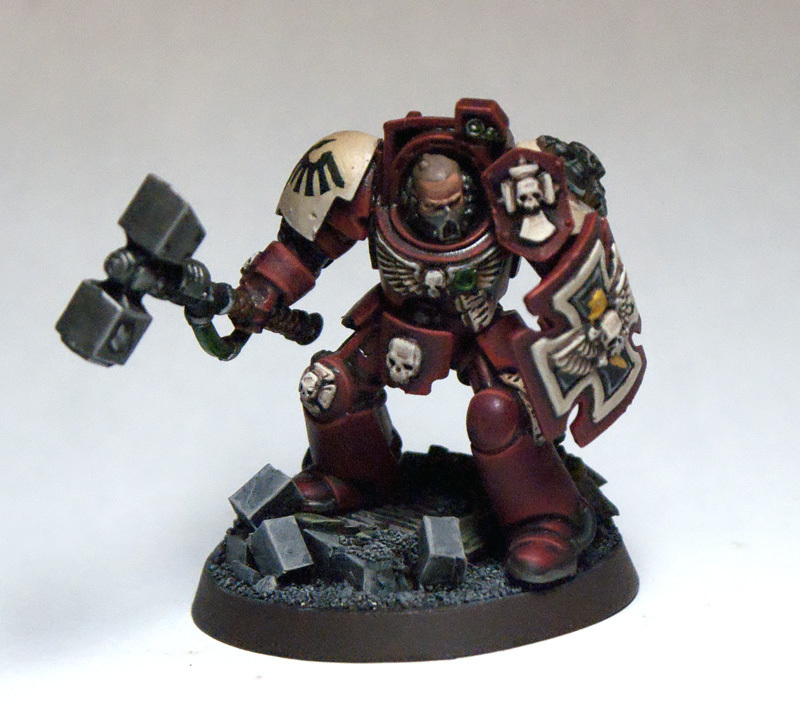 This must have also been around the same time that Dawn of War first came out because I decided to paint mine as a Blood Raven. 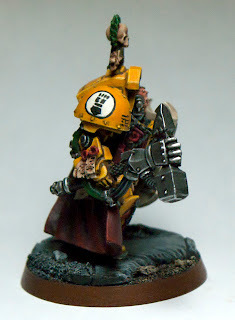 This is one of the few models of mine that has a "scenic" base like this. I like the look, and its great for one off models, but when its done across a whole army it kind of makes me wonder why each guy is standing on top of a small pile of rubble/rocks/skulls/etc. Thats a very odd battlefield to have so many small piles of stuff strategically placed around it. Both of these guys are available for purchase on Ebay. and here for the Blood Raven. Lysander is also up on CMoN here so be sure to vote for him.